Matt Ridley. HarperCollins Publishers, New York, 1999. This is a book someone was bound to write, and Im glad that it turned out to be someone who writes so well. Ridley is a British journalist, past U.S. editor of the Economist (my favorite weekly news magazine) and the author of several trade books on biology that focus on the evolution of behavior. In this book he focuses on the trendy advances made possible by the human genome project. The human genome is housed in 23 chromosomes. Ridley picks one newly-discovered gene from each of the 23 chromosomes and tells its story. Every story is interesting, and he has chosen his genes well — together he takes us on a grand tour of whats going on in modern biology. As you might expect, we explore Huntingtons disease, cystic fibrosis, and all sorts of cancer. We also meet genes that are little-changed since our ancestors were worms, and other genes that have appeared in the human genome only since early members of our species migrated out of Africa. 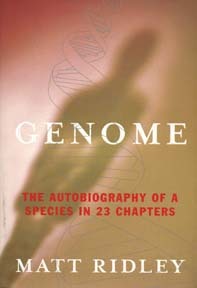 Reflecting his interest in human behavior, Ridley assigns a theme of human nature to each of the genes he explores. Fanciful, to be sure, but what he is trying to say is that our genes tell us about ourselves. Few messages could be more current, or more spot-on.